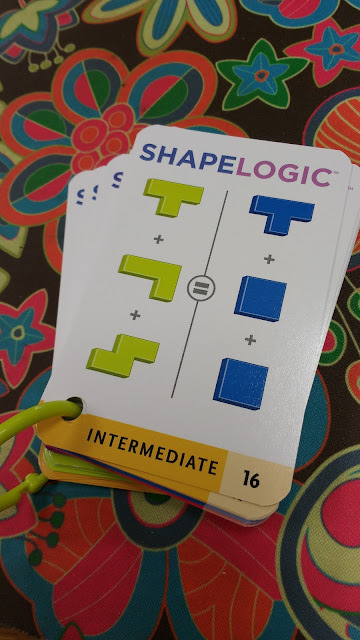 Recently, I began partnering with ThinkFun to review some of their new STEM brainteaser puzzles in exchange for a blog post. (Here's the required FTC disclosure: ThinkFun provided me with a free copy of this game in exchange for a blog post. The opinions included in this blog post are 100% my own.) It's no secret on this blog that I adore ThinkFun's games. They create logic based puzzles and games that are perfect for the math classroom! 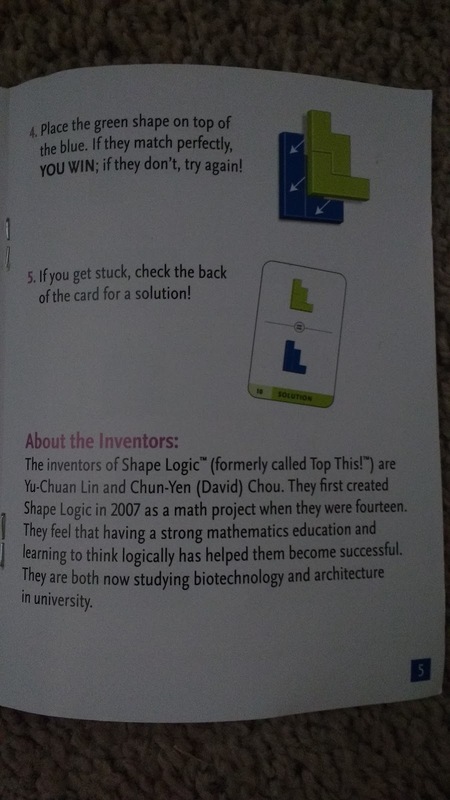 In my opinion, their most popular games are Chocolate Fix, Math Dice, Swish, Izzi, and Rush Hour. Last week, I reviewed their Brick Logic puzzle and posted about it here. 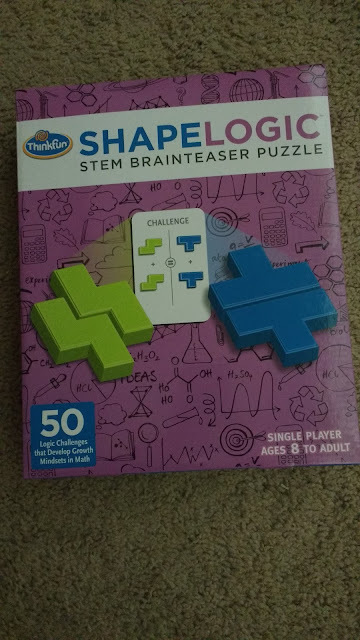 Today, I will be reviewing their Shape Logic STEM Brainteaser Puzzle. 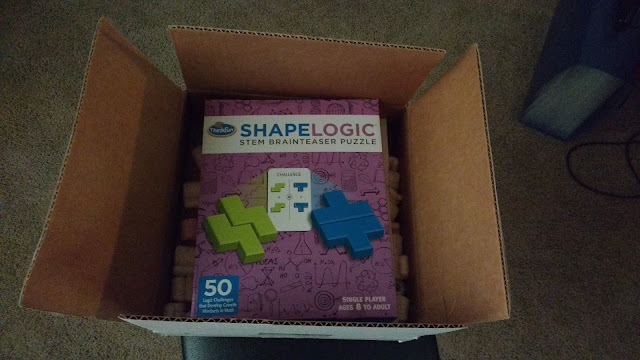 Since I had already reviewed the Brick Logic puzzle, I expected this puzzle to show up at my house in a similarly sized box. I was wrong. 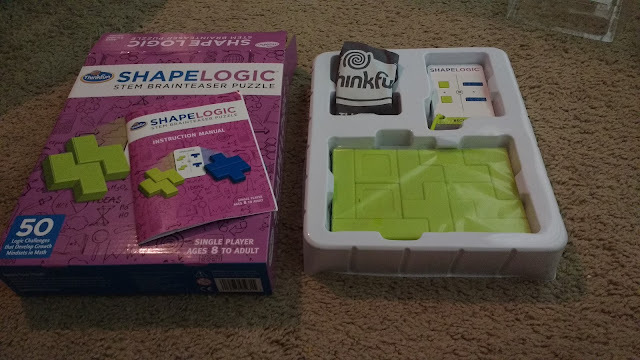 This box was MUCH bigger than the box for Brick Logic. It made much more sense once I realized that this puzzle contained many more puzzle pieces! This puzzle has been designed to promote a growth mindset with students. 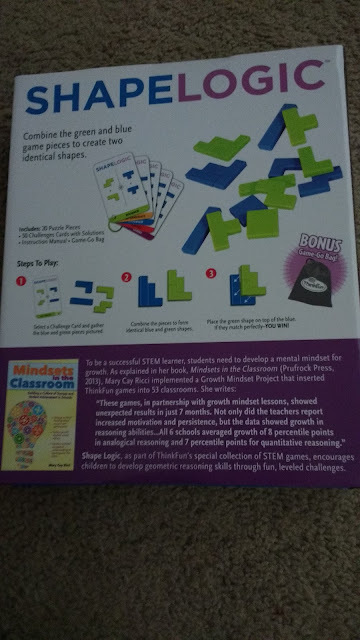 The back of the box mentions the Mindsets in the Classroom book by Mary Cay Ricci. Here's what I found after opening the box. There was a deck of challenge cards with a handy ring to keep them from getting messed up. 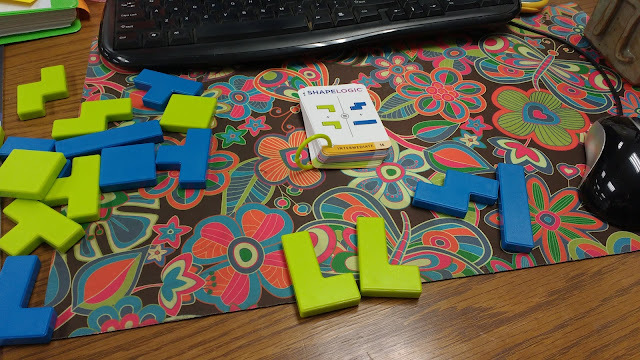 There was a set of blue and green puzzle pieces and a gray bag to hold the pieces. 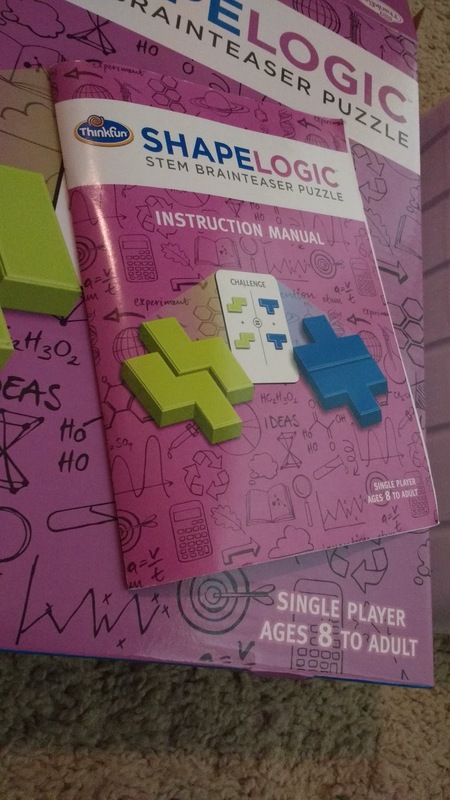 The puzzle also came with a small instruction manual. Here are all the pieces after I dumped them out in the floor of the living room. 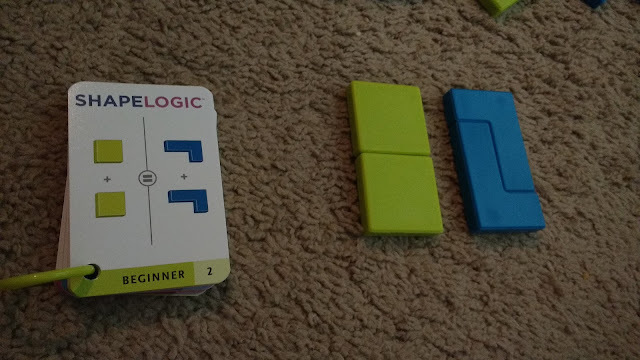 My husband saw them and informed me that these pieces are called tetrominoes. 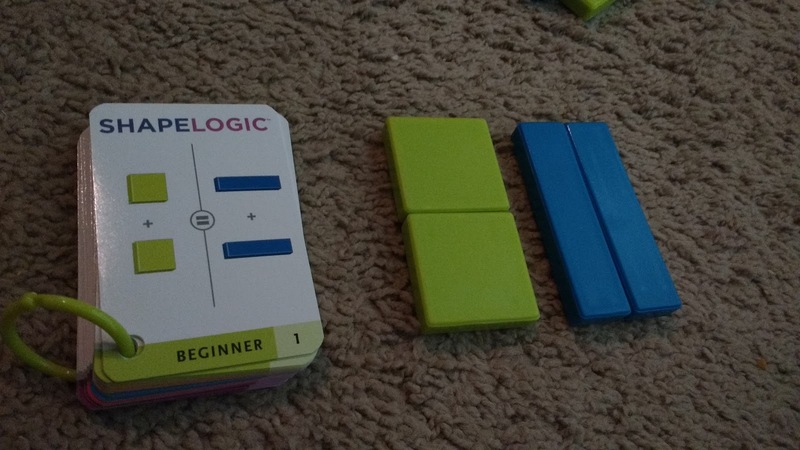 Unlike my experience playing Brick Logic, I quickly mastered the first few levels. I started to think this puzzle wasn't much of a challenge all. Then, I moved from the "beginner" level challenges to the "intermediate" level challenges. That growth mindset thing seemed waaaaaaaaayyyyy more important after that! Here's the way the challenges work. The card tells you to pull out two green pieces and two blue pieces. 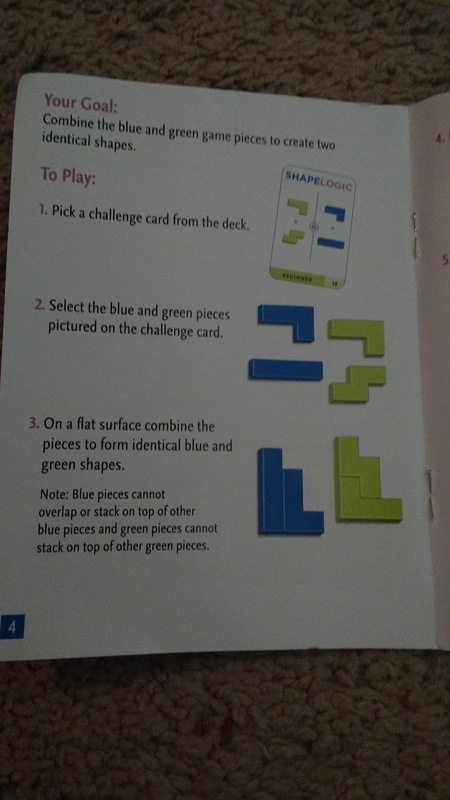 Your job is to arrange the green pieces and the blue pieces to form identical shapes. You can check that the shapes are identical by stacking one color of shapes on top of the other color of shapes. See how easy the first challenge was? Challenge 2 was a bit harder, but it was still quite simple. My husband insisted on getting in on the action and trying out some of the puzzles, too. Remember how I said the puzzles seemed easy at first? They stayed pretty do-able until I reached level 14. 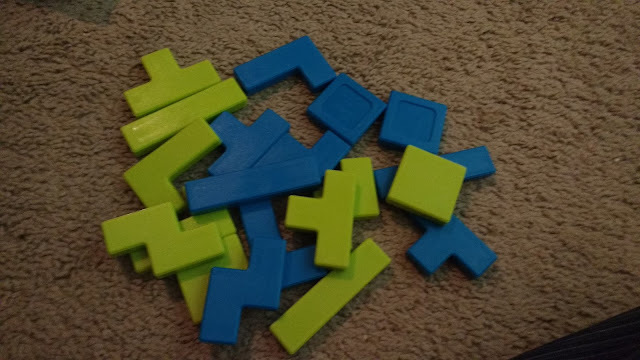 No matter what way I tried arranging the pieces, they would not match up. I got so frustrated with the puzzle that I put the pieces away. I'm the type of person who doesn't like to give up on a puzzle, so the puzzle ended up in my school bag the next morning. 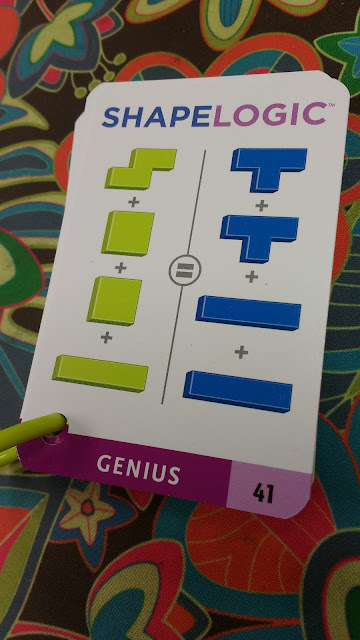 I probably should have been grading puzzles that day before school started, but I was trying my hand once again at puzzle 14. And, after some critical thinking and a bit of luck, I figured it out! I was so excited that I had to message my husband to let him know that I figured it out. The cards I showed earlier were the easy, beginner level challenges. Here's pictures of a few more cards to show you how the levels progress. Some of the intermediate cards use three pieces of each color instead of two. I haven't got this far in the puzzle yet myself, but I know two piece puzzles are tricky. I can only imagine how much harder it gets with three pieces. The last level of challenges is "Genius" level. Four pieces, woah! Here's a picture of some of my students trying out the challenges after finishing their quizzes early. They really enjoyed working together to solve the different puzzles. 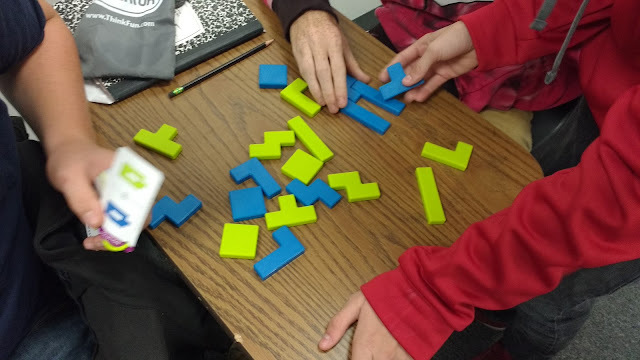 When given the chance to trade puzzles with another student, they didn't want to trade! I believe this puzzle is perfect for helping students develop both a growth mindset and visual/spatial reasoning. This puzzle would be a great addition to any classroom. It's a perfect challenge for students who finish early. Another way to use this puzzle would be to set up various brain teaser puzzles around the room and have students circulate through the stations. 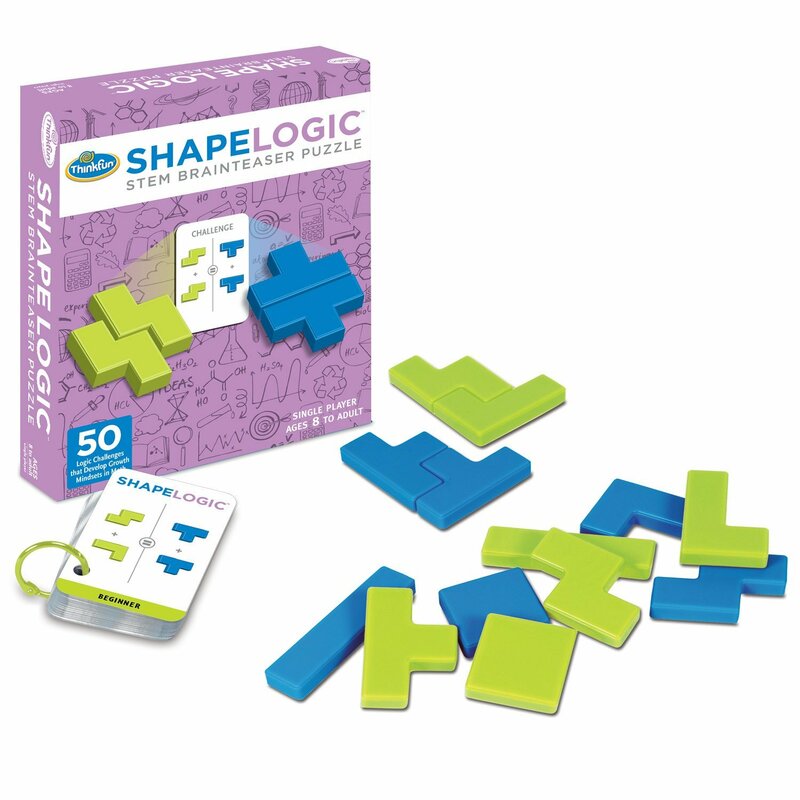 Shape Logic is currently available for pre-order from Amazon. 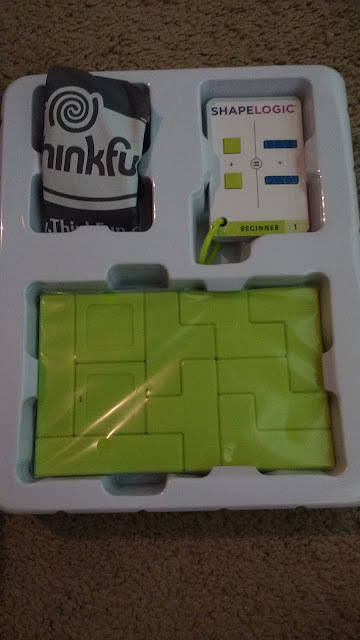 Thank you, ThinkFun, for providing another awesome puzzle to challenge my students! 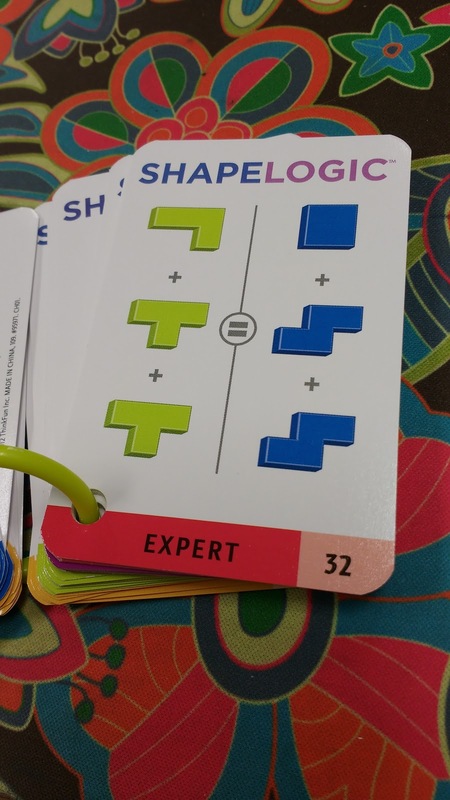 I just started checking out ideas for math in a middle school setting. 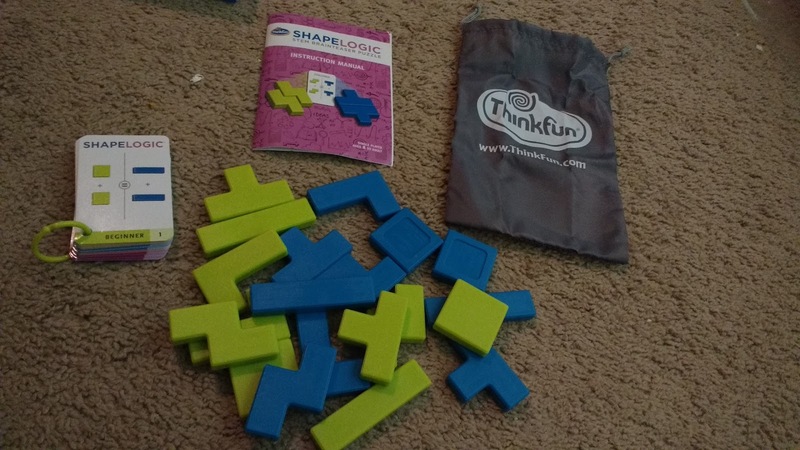 I am searching some blogs to get ideas and thank you for sharing about ThinkFun games. I very excited to try some logic based puzzles and your list of your favorites will help me get started. 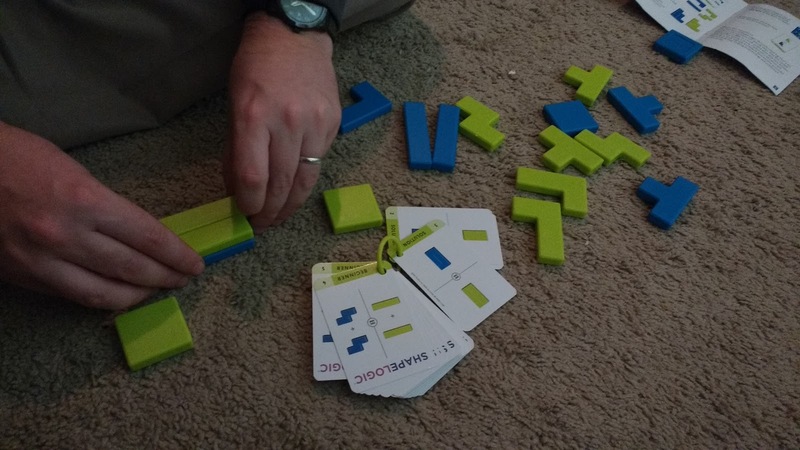 You and your students are going to LOVE their games!